Angel food cakes are just delightful – fluffy, soft and sweet. The full size cakes are light, but sometimes you just don’t need a whole big cake. Maybe you don’t have an angel food pan, which is crucial to success in baking a full angel food cake, or maybe you don’t want to use up a dozen eggs just for the egg whites. Perhaps it’s just too much cake to have lying around the house. Whatever the reason, it’s good to know that angel food cake can be adapted into a cupcake recipe quite easily. 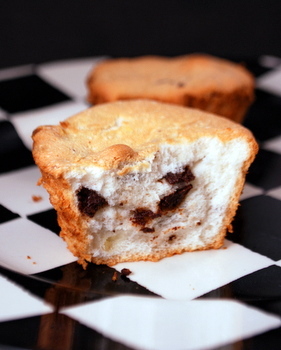 Angel food cupcakes are light and fluffy, just like their big brothers, but bake up in a regular muffin tin. They’re not quite as impressive to look at (small and with flat tops), but they taste great and are a yummy snack. I don’t frost angel food cupcakes because they are so soft that their taste and texture can be lost if you use too much as a topping. I opt for a simple glaze, if I’m going to top them, or leave them plain. To dress up this batch, I mixed some chocolate to make chocolate chip angel food cupcakes. I used some bar chocolate (dark and white chocolate) and chopped it up to act as my “chips.”Â Chopping up the chocolate is actually one of the most important things you need to do for this recipe before mixing them into the batter. Full-size chocolate chips can be too heavy for the delicate cake and will sink down to the bottom, causing not only an uneven distribution of ingredients, but probably causing the cupcakes to stick to the pan. Chopped chocolate – and you can use any flavor you like – will remain suspended in the cake nicely. One other thing to keep in mind is that it is better to either use a nonstick muffin tin or very lightly grease your pan. Cupcake wrappers tend to shrink around the cake when it cools, while the cake can cling to the sides of the pan as it cools to help maintain its ultra-fluffy texture. 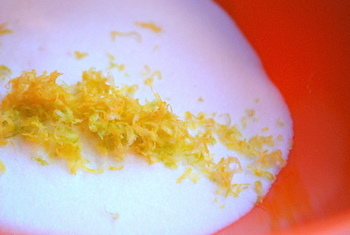 In a small bowl, sift together cake flour and 1/4 cup superfine sugar. Fold in flour mixture, adding it in two or three additions, and fold in chocolate chips when all other ingredients have been incorporated. Cool on a wire rack (unless you have a convenient way to flip the whole cupcake pan upside down). Cupcakes may sink slightly when cooled right-side up, but there is not a great difference between cooling them upside down and not with these small cakes. These look great – so light! I’ll have to try them. What a great way to do angel food cake. These look so delicious! And that plate makes for a stunning photo, too. This is brilliant! I’ve never seen Angel food cake made this way and just love it. A cake is always too much for the two of us, so muffins would be a perfect solution. Thank you for this recipe! I love angel food cake but don’t have the proper pan- but I do have muffin tins so now I can make these cupcakes! 🙂 I think they would be lovely plain with fresh whipped cream and strawberries. I love the idea of making angel food cupcakes…so much less of a hassel, with 100% of the goodness. Add those chocolate chips, and I’m beyond sold! These look great! What a great idea! I use egg yolks in my homemade ice cream, now I have a great use for all those egg whites. I like to use angel food cupcakes as a base for strawberry shortcake. Chocolate in the angel food sounds like a great addition to me! I think this is a great idea! I love individual desserts like this! Thanks for the recipe! i made these this morning for a dinner party this evening. DELICIOUS! I’m not great at following recipes – for the Dry ingredients, I used ap flour, with cornstarch, and table sugar. They taste like marshmallows! I made these and there was barely enough batter to fill one muffin pan following this recipe… and they were really small! i am going to try and triple the ingredients, they were only a half inch high. Is it essential to use superfine sugar? What difference would it make if I used regular granulated sugar? So good! Had no idea one could make angel food into cupcakes (although why not?). I spread them with a thin layer of Nutella as frosting. This is a great recipe! I found that if you put the mix in to muffin or cupcake cases made of paper it makes it really easy to turn them upside down to cool. Also it means that there is no butter so it is dairy free! I am making these cupcakes right now, as I had a lot of egg whites leftover after I made dozens and dozens of alfajores and wasn’t sure what to do with the egg whites…..I can’t wait to try them! Thank you for the recipe! I made these today without the chocolate chips and oh my gosh are they delicious! A wonderful way to use up egg whites and only 75 calories each! I will definitely make these again.